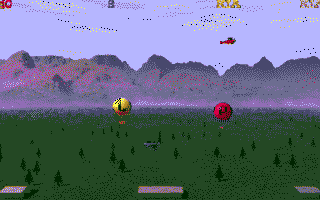 A beta preview of a game by Nature. a very playable beta as well. almost be a VCS 2600 game, a classic combat arena shootemup. this whizz-bang intimate little universe! gives a reasonable idea, even in this ST mode picture displayer. and 3-D'ness to the game. constantly  flying  in a straight line,  to allow me to shoot it  down! reviews, and want some help! problem peculiar to my hardware, I don't know? CiH for Alive! Magazine, Jan 2001.